You are here:Home » Category: "Ability"
Motorboat & Yachting: A MAIB report into the grounding of container ship Lysblink Seaways has revealed that the officer on watch was drunk at the time of impact. On February 18, the 129m cargo vessel Lysblink Seaways ran agroundon the west coast of Scotland near the port of Kilchoan. Practical Boat Owner: Scotland explores the potential for floating offshore wind technology to unlock deeper water sites. The world’s largest floating offshore wind development will be installed off the coast of Peterhead after the application has been granted a marine licence by the Scottish Government. Statoil propose developing a pilot park of five floating 6 MW turbines which is to be located approximately 25km off the coast of Peterhead with a generating capacity of 135GWh of electricity each year. It is expected that the Hywind Scotland development could power up to 19,900 houses. Unlike conventional turbines, Hywind turbines will be attached to the seabed by a three-point mooring spread and anchoring system. The turbines will be connected by an inter-array of cables and an export cable will transport electricity from the pilot park to shore at Peterhead. 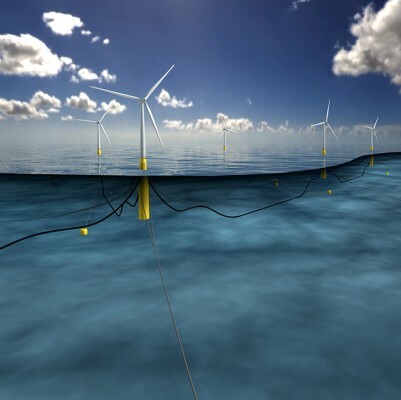 The Carbon Trust believe that floating wind concepts have the potential to reduce generating costs to below £100/MWh in commercial deployments, with the leading concepts such as Hywind, with even lower costs of £85-£95MWh. Scotland’s Deputy First Minister John Swinney said: ‘Hywind is a hugely exciting project – in terms of electricity generation and technology innovation – and it’s a real testament to our energy sector expertise and skilled workforce that Statoil chose Scotland for the world’s largest floating wind farm. Statoil’s executive vice president for New Energy Solutions Irene Rummelhoff said: ‘Floating wind represents a new, significant and increasingly competitive renewable energy source. Statoil’s objective with developing this pilot park is to demonstrate a commercial, utility-scale floating wind solution, to further increase the global market potential. The Royal Yachting Association is taking a keen interest in this and other floating offshore wind developments, particularly as operational safety zones are being requested by developers and in the case of Hywind, the Maritime and Coastguard Agency (MCA) has not supported the developer’s application for them. 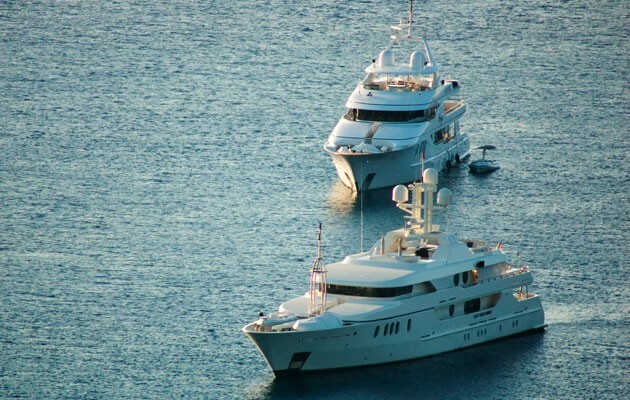 Motorboat & Yachting: Superyachts built in North America and the Caribbean will have comply with a new emissions limit on NOx emissions from next year. The International Maritime Organisation (IMO) is cracking down on superyacht NOx emissions, with a new limit due to be imposed next year. The new Tier III limit on NOx emissions is 74% lower than the outgoing Tier II and will apply to all vessels built in the USA and Caribbean from January 1 2016. This is likely to hit the superyacht industry hardest, as the limit only applies to recreational vessels that measure more than 24m in length, weigh more than 500 tonnes, and have engines with a total power output in excess of 130KW (excluding emergency back-ups). And with the widespread trend towards driving down gross tonnage, the IMO has stipulated that the weight limit will be removed from the regulations in 2021. He added that such restrictions are likely to be applied to the Mediterranean within the next twelve months, which could drive up costs for the big yards. According to Mr van der Heijden, potential ways to comply with the latest NOx emissions include using advanced no-soot diesel filters that have been widespread in the automotive industry for many years now. The 50ft yacht where Google executive Forrest Hayes was killed has been put up for sale in California. The yacht where a Google executive was killed has gone on sale for $345,000 in California. Forrest Hayes, 51, was found dead aboard the 50ft vessel named “Escape” in November last year following an alleged heroin overdose. Broker Richard Boland Yachts is now selling the boat, which was recently moved to the marina village in Alameda. The Alaska Flybridge 46 was built in 2006 and comes with twin Cummins 380hp engines and thermal night vision cameras. It’s been reported that lots of people have been looking at the boat, but so far there have been no offers. Broker Richard Boland told SFGate that he doesn’t think events onboard will deter any potential buyers. Hayes installed a security surveillance system onboard to monitor a refurbishment of the vessel, which later proved prostitute Alix Tichelman had been on board when he died. Santa Cruz police recently charged the 26-year-old woman with manslaughter after discovering footage of her injecting the victim with drugs and then leaving the boat when he fell unconscious. Testing: When asked if Motorboat & Yachting wanted to go to Plymouth to test the Princess 82and Princess 88 motor and yacht back-to-back, they jumped at the chance. This is an interesting comparison because on the face of it the two boats look very similar. Both have large, extended flybridges, enormous one-piece hull windows and those classic Princess lines. But underneath, they are quite different. The 82 is, according to Princess, the largest manifestation of the Princess flybridge boat. It has the famous Olesinski planing hull and the performance and handling that makes a Princess such an enjoyable boat to be behind the wheel of. In its own factory tests, Princess has seen an 82 with 1,800hp CAT C32s hit 37 knots flat out, pretty staggering for something that weighs over 50 tonnes.The 88 has a “hybrid” hull, which is designed to be comfortable and fuel efficient at 8-12 knots but still able to top 27 knots if you want to get a move on. The 88 is also where you begin to get some of the superyacht treatment, filtering down from the 32 and 40 Metre. So the level of personalisation goes up and you have private consultations with the yard’s Mayfair-based Princess Design Studio as part of the package. We decided to focus on the 82 as it is a bit more of an MBY boat. (Slightly) smaller and, from all accounts, more of a driver’s boat. The test boat was fitted with CAT C32 1,700hp engines, good for a top speed of 31.5 knots with fin stabilisers on board. The fins undoubtedly did a great job in rough conditions off of Plymouth but in terms of driving enjoyment their extra weight reduced top speed and their insistance on trying to keep the boat upright dulled the handling somewhat, too. Of course, this is all totally elementary because who really cares about whether an 82ft flybridge is fun to chuck around? And no one is going to be sniffing at the fact that it only managed 31.5 knots. But nevermind that small detail, where there is fun to be had is with the immense power of those engines. The way the 82 picks up in the mid-range is astonishing, huge waves of torque summon from the depths of the engineroom and thrust it forward at an alarming rate for something so massive. It’s simply immense, and this wasn’t even the largest engine option. Elsewhere, there is little to complain about. You can pay extra to have the Princess Design Studio treatment but even without that there is plenty of scope to adjust colours, woods, materials and other cosmetic elements.The one-piece hull windows that Princess has started to use across its range are particularly magnificent on a boat of this size. I spent most of my time on the water sitting in the master cabin watching the world rush by. A full report on the 82 (and some more detail on the 88) will be going into a future issue of the magazine. British powerboat champion Shelley Jory-Leigh will be supporting disabled teen sailor Natasha Lambert by leading her safety boat team during the 2014 Sea and Summit challenge. On 24 July, Natasha, aged 17, who has cerebral palsy and sails using her mouth to operate a ‘sip and puff’ mechanism, will embark on a month-long challenge sailing single-handed down the South West coast of England to Wales. Shelley and her safety boat team (Gary Coleman, Dan Whapples and Andy Smith) will accompany Natasha on the 430-mile journey, following in an eight-metre rigid inflatable boat (RIB) powered by a BF250 engine kindly donated by Honda UK. Shelley said: ‘I’m so excited to be supporting Natasha on her remarkable journey this July and August. ‘Honda has provided me with my old start boat from my early Honda racing days which is fantastic. I would also like to thank Redstone, who are supporting our team to be able to make this happen. ‘Ever since I first met Natasha I’ve remained friends with her and wanted to support her. She has been out in a powerboat with me and just laughed the whole time wanting to go faster! Natasha said: ‘Shelley is just awesome and she’s a fab role model. I’m so lucky to have her and her team helping me and I really appreciate them giving up their time. The Sea and Summit challenge will see Natasha sail 430 miles and climb 2,907ft whilst raising money for the RNLI, the Ellen MacArthur Cancer Trust and the RYA Foundation, as well as the profile of sailing for people with disabilities. Thousands are expected to flock to London’s St Katharine Docks this Saturday to welcome the Clipper fleet home. But dramatic footage has been released today of the moment the GREAT Britain team were hit by a tornado as they competed in the Clipper Round the World yacht race. The 12-strong Clipper Race fleet will return to London this Saturday, 12 July 2014, after covering more than 40,000 miles between six continents over eleven months. A total of 670 novice sailors from all walks of life, aged 18 to 74, were trained to take on the biennial endurance challenges, currently in its ninth edition. Crew have experienced a wide range of weather conditions from the benign to the extreme: in addition to the tornado incident they have endured being knocked down by giant waves, battled hurricane force winds, dodged icebergs and growlers; extreme heat and cold; been on the alert for pirates; had coast guard assisted medical evacuations and rescued of a man overboard after being lost in a Pacific storm for more than an hour. The footage of the tornado was captured by a fixed on-board camera attached to the mast looking down towards the stern. It shows the team in challenging conditions a week out of Australia heading towards the equator with heavy rain and squalls battering the fleet. The waterspout was pretty invisible in the conditions at the time and hit without warning, rolling the boat through 120 degrees pinning the mast down on the ocean’s surface in swirling winds over 100 knots. Crew are thrown into the sea on their tethers and scrabble to hang onto the boat which starts to right itself as the tornado passes and is visible in the upper left hand side of the screen disappearing into the distance as the crew start to clamber back onto their feet. Crew member Paul Hardy, aged 43, an IT consultant from Brighton is seen desperately trying to grab onto the mast after he is submerged into the sea as the yacht is hit by the tornado. Thousands are expected to descend on St Katharine Docks to welcome the Clipper crews back to London after 11 months circumnavigating the world. But even those who cannot attend the big event will be able to watch the action online thanks to a Live Stream, which will be available from 11:45 BST (1045 UTC/GMT), by clicking this link. The Clipper Race fleet are expected to finish racing in the early hours of Saturday, ready to parade up the Thames at 07:30 from Southend. Boatowners are urged to check the state of their boats before venturing on the tidal Thames, following an increase in the number of mechanical incidents. The Port of London Authority (PLA) has advised boatowners to make sure they carry out routine mechanical inspections before heading out onto the tidal Thames. The warning comes after an increase in the rate of mechanical incidents reported on the river, with 11 in the six weeks around Easter. Skippers are encouraged to check they have sufficient tackle and are able to anchor safely in the case of difficulties such as engine failure. The PLA adds that navigating the tidal Thames can be tricky, with up to 1.2m waves and a tidal flow of up to four knots. This compares to 371 water-related deaths in 2012, and 407 in 2011. As in previous years, fatalities at the sea, on the beach or shoreline accounted for nearly a third (115), while a further 22 deaths happened at harbours, docks, marinas and inland or coastal ports. The NWSF’s Water Incident Database (WAID) reveals that in 2013, the age group with the highest number of fatalities (31) was males aged between 20-24. The peak summer months of July and August witnessed the most deaths with 106 during this period. The leading activities were: people walking alongside water and falling in, swimming (predominantly in open water), and tombstoning – jumping into open water. There were 260 deaths in England, 56 in Scotland, 41 in Wales and 11 in Northern Ireland. In England, the South West (53) and the South East (50) regions had the highest number of deaths. Jim Watson, deputy chairman of the NWSF, said: ‘Although the number of accidental drownings and water-related deaths has remained consistent in recent years, there should be no room for complacency, particularly as we enter the warmer summer months and more people are drawn to the water. Local authorities suspect a welding accident caused this huge blaze, and one quick-thinking local skipper caught the fire on camera. There’s nothing more devastating for a boatowner than seeing your pride and joy go up in flames, but Larry Jodsass got a better view than most boat fire victims. The 79-year-old retired entrepreneur lost his 31m superyacht ‘Polar Bear’ to an enormous fire last month (19 June), which local authorities suspect was caused by a welding accident. The blaze was so large that it could be seen from all across Chula Vista harbour in San Diego, and quick-thinking skipper Kurt Roll launched his drone camera to take a closer look. From the point of view of the remote-controlled gadget, we are treated to an excruciating close-up of the demise of ‘Polar Bear’. Since the footage was uploaded to YouTube last month, it has received more than 1.8 million views, and it’s not hard to see why.